The Euganean Hills are formed by a hundred elevations different in shape and height, which occupy an area of almost 22 thousand hectares, with a perimeter 65 kilometers. Mount Venda, with its 601 meters high, marks the center and most elevated point of the hill system. The striking appearance, sweet and sour at the same time, the variety of rocks and the large number of volcanic phenomena are a complex geological and almost unique feature of the Euganean Hills. The hilly area was once covered by a shallow sea; the steep cones characterize the landscape originated during a single eruptive event, the accumulation of powerful flows above and in the vicinity of the crack. Each hill is therefore a unique product. A part of magma, due to the low viscosity and high temperature, failed to cross the marine floor, stopped at short depth giving birth to rounded hills, soft profiles that are well in accordance with the surrounding plain. A thorough knowledge of the morphology, orogeny and microclimates of the area it is essential to create grapes and wines from strong expressiveness and a definite character of this area. The climate of the Hills, for example, assumes a different connotation than the regional average by having a distinctively more Mediterranean aspect with its low rainfall and greater insolation. 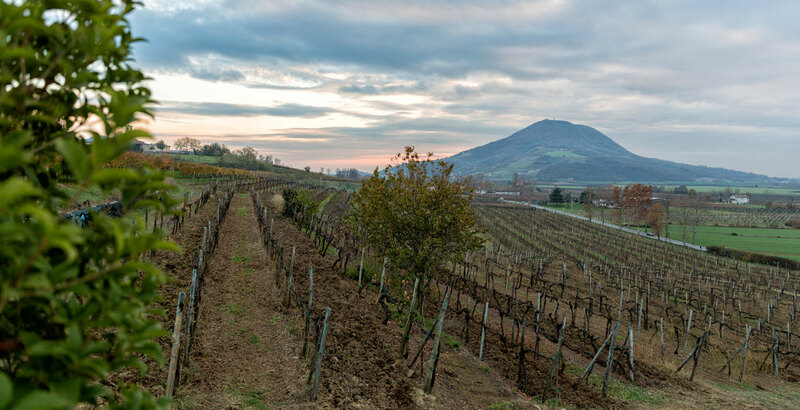 In addition, the perfect balance of minerals found in the earth, allows the production of excellence “aromatic constituents”, components which raise the quality of the wines of the Euganean Hills.